The PlayOJO casino is a very special one on the UK-market. It is different to many other online casinos and provides lots of fun and no wager requirements. Did we make you curious? Then keep reading and learn why it is so special in our PlayOJO Casino review. 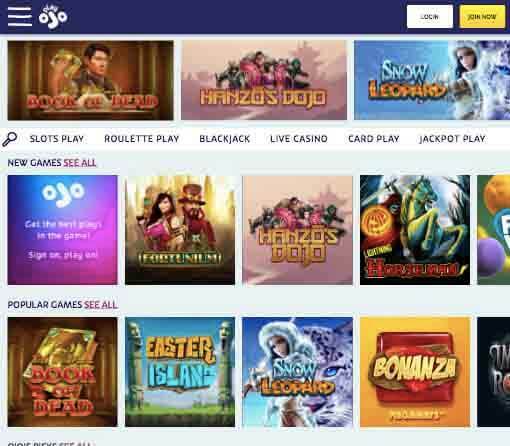 OJO is around for a couple of years and provides us with the best games, bonus offers and funny and playful casino experience. 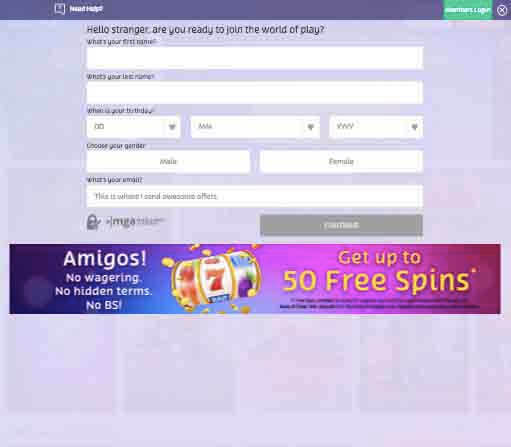 The site has a lot of good things for it, such as the vast number of games, the friendly easy to navigate interface and their many bonuses, offers and promotions. The casino site has the most popular games in the online gaming community, which is why it doesn’t suffer from gaining users and create they a nice community feeling on their site. Another reason is their loyalty program which has a very good system going on there. Let us provide with all the information about the Casino in our PlayOJO Casino review. PlayOJO is available in many English-speaking countries and available in several different languages. But there are many countries where the PlayOJO casino is restricted. That includes mainly the USA They have the licenses from two different gaming authorities – the UK Gambling Commission and the Malta Gaming Authority. Countries like Australia, Estonia, Bulgaria, Greece, Poland, Portugal, Slovenia, Hungary, Romania, the Republic of Cyprus, Czech Republic, Italy, Israel, Turkey, the German State of Schleswig-Holstein, France, Mexico, Spain, Denmark, Belgium and some others have also restricted access to the site. Australian players are also banned from the site. You can get the full list from the website’s terms and conditions page. We can highly recommend that you give this a thorough read if you are unsure about your eligibility. Note that no matter where you are playing from, you need to be 18+ to be able to do online gambling. PlayOJO has teamed up with a lot of popular software providers and some less known ones. This variety makes it possible for them to offer the amount of diverse games they do. The PlayOJO game section has the perfect game for any taste and they come from the best providers in the industry. Microgaming, NetEnt, Play N’ GO, Evolution Gaming, NextGen Gaming, Merkur, Amaya, Quickfire, Barcrest, Extreme Live Gaming, and Nyx are just some of the software providers that make the OJO casino so divers. Of course, these software providers offer some of the most famous games out there. For example, NetEnt’s game Starburst is one of the most popular games now and games like Gonzo’s Quest or Book of Dead are always fun to play. Of course, PlayOJO offers those and many other games. Not many online casinos out there team up with that many providers and give us that variety of games. It is no wonder that PlayOJO is among the most popular online casinos. And if you have the chance to play free spins in the OJO casino you will not have to wager them first, which is a huge plus. Many different payment methods available. Regular tournaments with attractive prizes. The customer support can be slow sometimes. Some payments methods come with fees. The casino website is fun to enjoy as well and comes with a bright and playful design. The logo with the big smile is already kicking off the fun, when the website charges and the blue and purple colours make the site calm but colourful at the same time. Skill-on-Net has shown that they know how to craft websites that run great and PlayOJO is no exception. There are no issues with loading speed or reconnection while playing our favourite games on the PlayOJO site and the menu is easy to use. Navigation on the site works well and we could not spot any technical issues. In case there is something just get in touch with the PlayOJO support team. There are about 500 games in the PlayOJO Casino and most of them are Slots. So if you really like the colourful games you will love OJO. They Slots here come in all shapes and colours. There are the classics that we usually know from physical casinos and bars and there are well-design and innovative slots as well. OJO guarantees a huge variety in themes and winning lines. And they have the perfect bonus for any slot fan. You will have the chance to play popular games like Starburst and travel to unknown worlds like in Gonzo’s quest or try one of the innovative Yggdrasil games. If you like it really thrilling you can try one of OJO’s Jackpot slots, which offer prizes of several millions of pounds. The casino is always adding new games to their portfolio. Games like Dragon Wins, Sea Hunters, Planet Fortune and Life of Riches are just waiting for you but there is a lot more to discover. From the table games, there is a decent amount of table and card games. You have the option to play different Blackjack, Poker and Roulette variations. They also offer Baccarat, dice games and other less famous casino games. At PlayOJO you can also find a lot of live casino games but the main focus are the slots. Of course, one of the most important and of the best parts are the bonuses and promotions at the OJO casino. For newbies and first depositors the online casino has a bonus of 50 Free Spins, without any wager requirements. The spins are given for the game book of dead and they have a value of £0.10. The maximum is about £1 from one spin. But there are plenty of ways to earn free spins in the PlayOJO casino. One of them is the OJO-Wheel. A unique feature that offers a lot of free spins for loyal players. There are three wheels you can pick from and the stakes and prizes are just going higher. It is kind of like a dream catcher but there is always something to win. All the prizes from the wheel are paid in cash and there are no wager requirements. For even more frequent players and VIPS there is the OJOClub. Club OJO offers even bigger rewards and other prizes like trips, tickets and many other types. The club consist of many different levels and the best thing is, you can just climb them. The different levels come with different amounts of prizes and bonuses. Furthermore, there is the OJO plus feature, that allows you to earn free cash. It gets added to your balance while you play. And you know the drill by now – there are no wager requirements on that bonus either. The feature is symbolized by the OJO Logo and once the OJO plus icon turns around the OJO face once you will receive free money to play with. To keep up to date with all the frequently run promotional offers at PlayOJO, we highly recommend you to subscribe to their newsletter. To gain some extra free spins and other promotions keep an eye on OJO’s social media and take part in their many fun riddles on the OJO Facebook page. It is also a good way to keep up with news and promotions happing in the casino. A mobile casino site makes you more flexible in your game play and you can use your favourite casino and their bonuses everywhere. The net win is just one fingertip away and those long supermarket queues can pass by really quickly. Who knows, maybe you hit the jackpot in the tube on our way to work. PlayOJO has a unique App in the Google Play store and the Apple Appstore. The App offers all the features you can also find on the mobile site and the desktop version of the PlayOjo Casino. The App runs without issues and all of the promotions and tournaments are also available on the app. You can enjoy all the OJO fun from your smartphone. As we are committed to deliver a complete PlayOJO Casino review, we tested the mobile site accordingly. There is no feature we left out. If you want to play from your smartphone you can use the PlayOJO App or choose to use the mobile website, which runs just as good. To use the mobile version, you do not have to download anything and use precious memory space on your phone. All of the features we learned to love on the desktop version are available on mobile too. The mobile OJO site runs smoothly, is perfectly optimised and loads really quick. You will not have any issues using the mobile casino with your data plan since the loading speed is very quick and the games load in no-time. The site runs on Android and iOS phones without any trouble and is also available on windows phones or blackberry. And another positive factor are the promotions and bonuses, that are working perfectly on the mobile PlayOJO website as well. Sometimes the casino offers a unique bonus just for the smartphone version. You can spot all the features easily as the PlayOJO casino interface looks nice on the mobile version as well and is easy to navigate. Even on the mobile version you will have access to the over 500 games offered by PlayOJO. There might some games that are not there yet, but most of them are. All of our favourites are present in the mobile OJO casino and run perfectly. There might be some specific games that are just available on desktop, but those are almost not to recognize and we are positive that OJO and the providers are bringing them to the mobile version very soon. Also, the jackpot games and the live casino is playable on the mobile version and brings extra fun for the way to work or airport waiting lines. All in all, we can add to our PlayOJO Casino Review that the mobile site runs perfectly and is not lacking any features or suspense compared to the regular site. Does PlayOJO have a Live Casino? If you like the atmosphere of a casino you will love the PlayOJO Live Casino. They offer a broad variety of casino tables, such as Roulette, Blackjack and Dream Catcher. There are even some Baccarat tables and other, less popular games. The live casino is powered by Evolution Gaming, NetEnt, Extreme and Pragmatic. OJO did a great job in selecting the best live casino games of those providers. The casino tables are available in many different languages and they are interactive. In that way you can enjoy a chat with the lovely dealer. You will really enjoy the London Roulette or the themed Roulette tables. We hope that they will add Poker games to the OJO live casino soon. Withdrawals and deposits are made easy at PlayOJO. They offer a variety of payments methods and never take too long to process them. The prices and fees for all payments are transparent and fair. PlayOjO never tries to hide them from you and you can expect your payments fast without complications. The available payment methods at the PlayOJO casino site to make deposits are Credit Cards, Debit Cards, Wire Transfer, NETELLER, Skrill, Paysafecard, PayPal and EcoPayz. And for withdrawals you have the option to use Credit Cards, Debit Cards, Wire Transfer, NETELLER, Skrill, Paysafecard, PayPal or EcoPayz. The casino is working on adding more and more methods so you will have more options soon. There are no fees associated with making the deposits with any of the mentioned payment methods. As for withdrawals, certain methods can cost you a small number of fees, so make sure you read the terms and conditions to know your options. The transactions are processed quite fast and you will get your deposits on your account almost immediately. Usually you have the funds on your accounts once you hit the ok button for the payment. Withdrawals are processed quickly as well, but they might take a little bit of time until they arrive at your bank, card or e-wallet. That usually depends on the payment method. The withdrawals at OJO are processed in the same day. E-wallets like Skrill, Neteller and PayPal are usually very quick and you might get your winnings on the same day. Mastercard or Visa users will have to wait 3 to 5 business days to receive their funds. The maximum withdrawal amount depends on the method you choose. Most of them do not have a max. amount. Others are limited but you can always see the maximum amount in the cashier sections, if applicable. You cannot withdrawal less than £20. The minimum deposit amount is £10. The live chat support is available from 6:00 to 00:00 GMT. If you want an urgent fix, it is better to reach out via the live chat option as sometimes emails take a bit longer. If your waking hours don’t fall on their live chat window, you can send them an email then. Just send it directly to [email protected] You can fill out the contact us form from the help section of the site, and someone will reply back. You can also us the live chat to get directly in touch with. The customer support is available in other languages other than English as well, including Finnish, Swedish and German. PlayOJO is part of Skill-On-Net, a software provider with a lot of experience and many other successful gaming platforms. The base of the provider is in Malta. They even create their own games and they are available on the PlayOJO site as well. The company has a lot of experience and that helps to offer the best quality. PlayOJO is licensed under the UK Gambling Commission and the Malta Gaming Authority. These two licenses show us that the site is secure and supported by the online gambling authorities. Regular audits by independent parties are held as well to ensure fairness. PlayOJO casino site is fair when it comes to treating its players, be it the promotions or the games. The games all run with a random number generator, which assures to keep the games random. No outcome is manipulated in any way. The site is accountable for its actions because of the licenses. Any unfair business will result in an investigation and there is a possible risk of shutting down the entire business. As a result of these laws and frame work is the site dedicated to keeping everything fair for their customers. The playful and funny PlayOJO casino site has impressed us, despite being a new one, and some minor drawbacks here and there. They do have a good range of games with a fair enough welcome bonus offer. The ongoing promotions are great, and the benefits of the loyalty program are quite tempting. Overall, the PlayOJO casino is worth it and offers many unique and attractive features for their players. Needless to say that the lack of wager requirements impressed us a lot. After our in-depth PlayOJO Casino review, we would like say that there is almost nothing bad to say about the PlayOJO casino. We hope that they will add some more payment methods and live casino games however to make playing in the Casino even more fun. Until then there is nothing left to say as to wish you great fun in the PlayOJO casino and good luck. We hope you will like OJO as much as we do.